family camping trip: doing it. – Reading My Tea Leaves – Slow, simple, sustainable living. Once you’re in the woods with mosquitoes, and middle-of-the-night rainstorms, and things that go bump, all of your planning gets put to the test, quickly. Here’s a little rundown of how our first official camping trip as three went down. Some thoughtful planning for this trip proved really helpful, which isn’t to say that everything went off completely without a hitch, but which is to say that even the few little hiccups we had weren’t anything we couldn’t handle. In questions of wardrobe, and gear, and foodstuffs, it was nice to know that we weren’t going to be out in the woods without something that we needed. It’s not so much that we were in a spot so remote that picking up last-minute supplies would have been impossible, but a little bit of planning meant we didn’t need to make rushed purchases or create a lot of trash with last-minute disposable items. Mostly, we had everything with us that we needed. Camplife. My dad convinced us to bring along my family’s 1980s Coleman camp stove, and I have no regrets about the extra bulk it took up in the trunk. 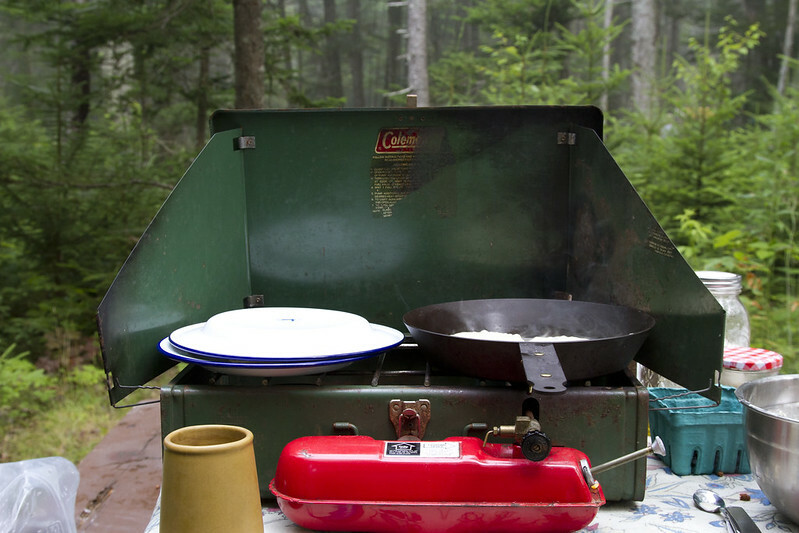 Our whisper-lite stove is great, but it’s a little rickety and it was really nice to have a solid stove that we could rely on for early morning breakfasts and dinners. Especially when there’s a mama bear and cub in our family who can get a little hangry in the early morning. Also at my dad’s suggestion, we decided to buy a small collapsible plastic jug to fill up with water to make dish washing roughly twelve times easier. We’d brought a liter mason jar to refill, but it proved a little cumbersome to tote back and forth from the spigot. Dishes drying. We decided to just pack two of our regular mugs instead of investing in new ones. 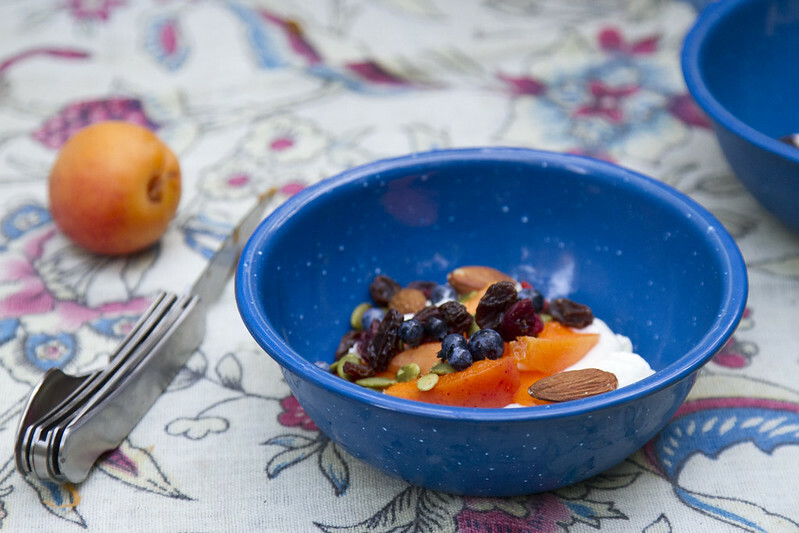 Enamel bowls filled with fruity breakfast yogurt. For food, we brought a small cooler which we filled with yogurt and eggs and a small bottle of milk in addition to veggies that we picked up at farmstands and markets daily. The cooler wasn’t big enough to stash a six pack of beer in addition to our other perishables, so we enjoyed a bottle of wine instead. In hindsight I actually think the small cooler stopped us from overbuying food that we might not have realistically been able to finish. For non-perishables, we brought a basket filled with mason jars with things like olive oil, salt and pepper, peanut butter, jam, oats, and “pancake mix.” An extra jar or two was handy for saving portions of things like cheese that can get grody in a wet cooler. For nearly every meal we used Best Made’s new Takedown Skillet, with a removeable handle. They sent one our way before we left and I don’t think I’ll ever cook on anything else. 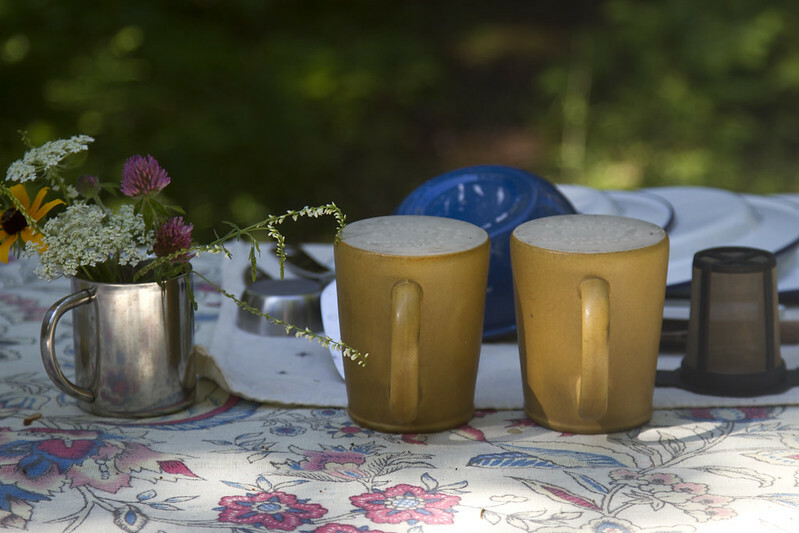 We also used their three-in-one Hobo Knife, which breaks down into a separate knife, fork, and spoon, in addition to enamelware plates and bowls that we already had. The utensils and skillet were really fantastic. The skillet was beautifully seasoned (with a smooth bottom!) but lightweight and we used it to make everything from one-pot pasta, to roasted tomatoes, to scrambled eggs, to oatmeal, to pancakes, to grilled cheese sandwiches. The utensils we took out with us every day and used them for making peanut butter and jelly sandwiches and cutting up fruit on the go. I thought you might need to see us in all of our sartorial glory. Too bad the photographer cut off the fact that I’m wearing sandals with those socks. We didn’t bring any kind of rain covering for our “kitchen” area, which might have been slightly foolhardy. Happily our tent comes with a terrific fly cover and on one night when it poured during the dinner hour, we wended our way down to Bass Harbor for fish sandwiches and grilled cheese and no one missed the camp cooking or minded the soggy tablecloth come morning. 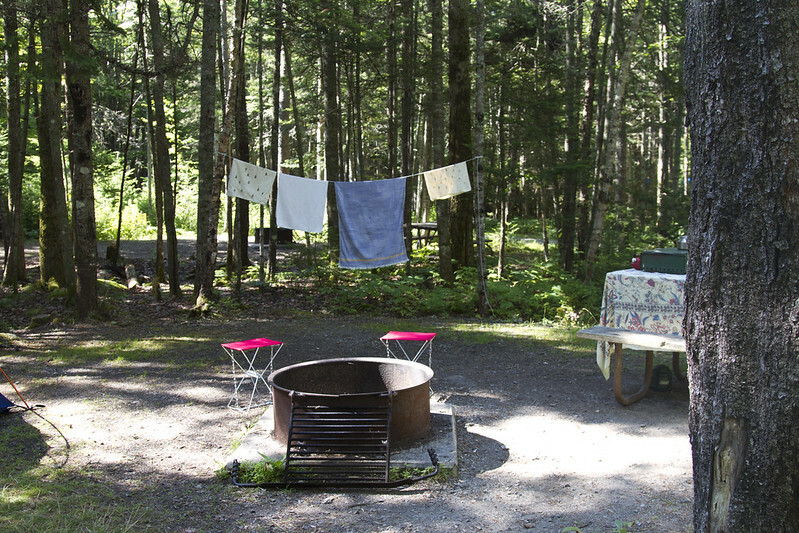 We picked up a bit of line at a camp store to hang dry dish towels and the tablecloth dried before dinner the next night. Next time we do car camping, we’ll probably bring along a rain tarp that we could string up above our table if need be. 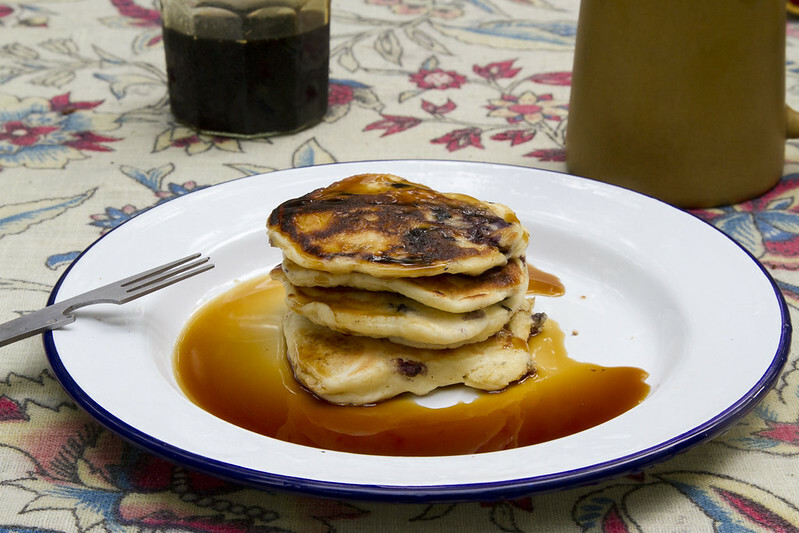 Pancakes drowning in maple syrup, as they should be. Most nights we were able to put Faye to sleep in the tent and then enjoy a little fireside time, just the two of us. Two canvas camp stools, also gifts from Best Made Co., were fantastic and minimal additions to our camp gear and were really nice for having a place to perch. We debated buying a chair for Faye that could attach to our picnic table, but ultimately decided against it and had her sit on our laps to eat dinner. I’d say if you have one, bring it, but I wasn’t convinced we’d get Faye to stay put in it for more than a few minutes at a time anyway. Questions of gear and planning aside, here’s the thing that really matters: we had so much fun. To avoid disaster, we mostly carried Faye during food prep at the campsite, but otherwise we let her explore, dirt and bugs and other things be damned. Yes, she loved it. Yes, she tried to eat every single pebble on the forest floor. She especially loved treking up and down the woodchip-covered path of our campsite over and over again, appointing herself the one-woman welcoming committee to every camper in the campground. We stayed at Seawall Campground in Acadia National Park, which is beautiful and quiet if absolutely chockful of other campers eager to breathe the fresh Maine air. We reserved a spot in the D-loop, where we’d camped before and really enjoyed because even though it’s technically car camping, all of the cars are parked away from the sites. The park provides wheelbarrows for hauling gear back to the sites and the result is a super quiet and peaceful experience. And while every site was filled with campers, the busyness didn’t bother me at all. In fact, I really enjoyed the company of fellow campers. Surely it had something to do with the fact that we were surrounded by a good majority of folks who appeared to have newly reached grandparent age and who were delighted to see such a tiny happy camper, but the whole experience was really joyful. Joyful not just because it felt good to be out in the fresh air and sleeping under a sky filled with stars, but because of the sense of comraderie. 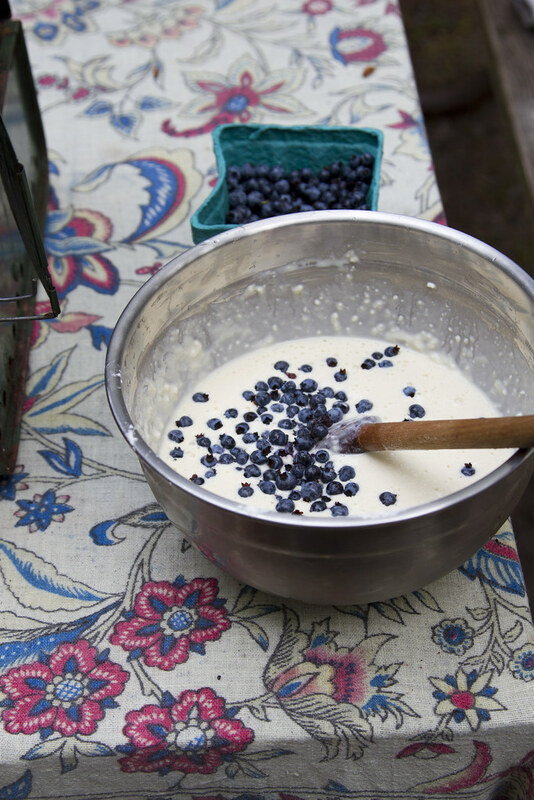 The good cheer of fellow campers, the encouragement, the shared eggs and blueberries, and the patience with a little bug who wakes up a little bit on the loud side, were all really life affirming. The trip was terrific not because anything we were doing was that exceptional, but because we doing what other people were doing: packing up a car with a few essentials, not worrying about a little dirt, and reveling in the wonder of the world. And there were lots of babies. As always, the specifics don’t really matter, but in case the nitty gritty is what you’re after, here’s the gear that we ended up bringing. * We packed most of it into an empty wooden crate that we had at home, and into our picnic basket, which proved really helpful for keeping things dry and contained. We could have easily gotten away with more and gotten away with less. I was glad that everything that we packed fit neatly into the trunk of our Silvercar rental and that we weren’t battling a cramped car for two weeks. We surely could have spared some things, but mostly this was a list that worked for us this go-round. *Some of our gear is older than we are, so these links are to similar products, not exact matches. Other items are pretty self-explanatory so I’ve left off links. Happy to answer specific questions if you have them! 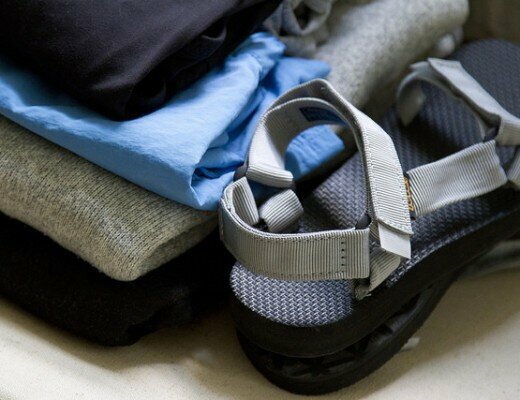 growing a minimalist wardrobe: camp edition. Sounds like a wonderful trip! 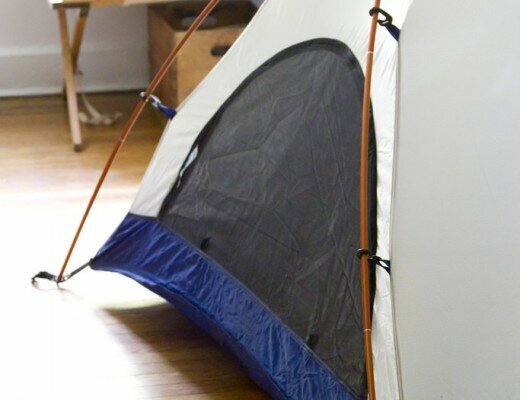 You are so lucky that your little one is a good tent sleeper. Ours is terrible but we enjoy the groggy camping anyway. oh, darn it! if it makes you feel any better, the transition to sleeping back home has been slightly less than smooth! babies! Where is the beautiful tablecloth from? It's a block-printed tapestry that I bought in college from a little imports store in Burlington, Vermont! Looks like a fabulous trip & you sure packed well! Looks like a fantastic trip. If you get to wanting to replace your Thermarests, then I can wholeheartedly recommend the Exped Synmat range, particularly the ultralite ones. They are effectively an air mattress (with insulation), so much more comfortable than a Thermarest type, plus they pack much smaller. I would though recommend getting the wide/long versions – if you roll off them you're further from the ground than with a Thermarest. 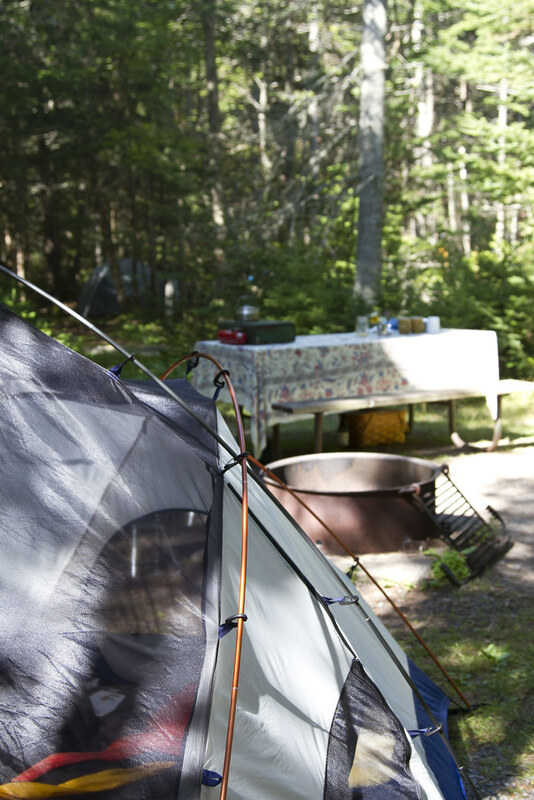 Out of curiosity, do you leave your campsite set up when you're out and about during the day? I know different places have different recommendations for that, and I'm always curious how people choose to handle it! On days when rain threatened we put the stove, picnic basket, and camp stools under the picnic table, but otherwise we left everything set up! I've never been the outdoors type, but your post and pictures (the colors look so vivid) make camping look like fun! What did you do for diapering Faye while you were gone? 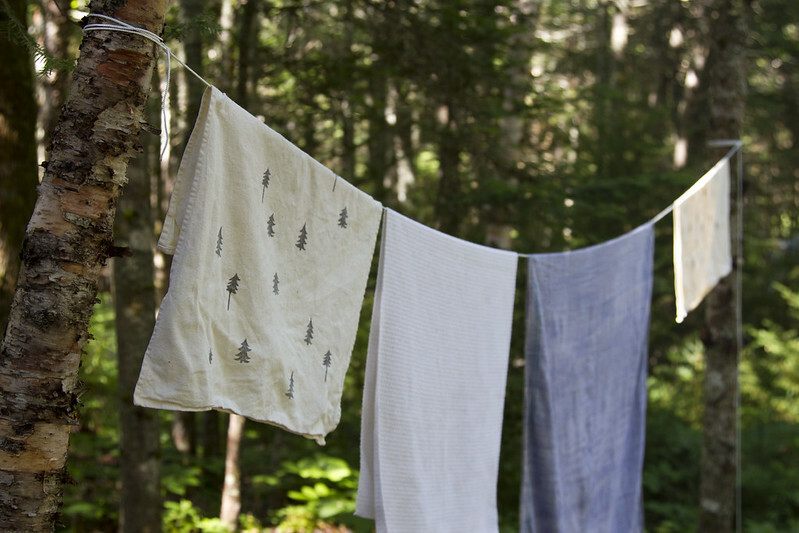 We cloth diaper also and I've been wary of long, outdoor trips because stinky. We use Seventh Generation disposables when we travel. It's always a bit of a learning curve for me—little suckers don't hold as much as cloth it seems—but we got the hang of it eventually! Sounds like an amazing trip! I would love to check out that campground. Thanks for the tip. 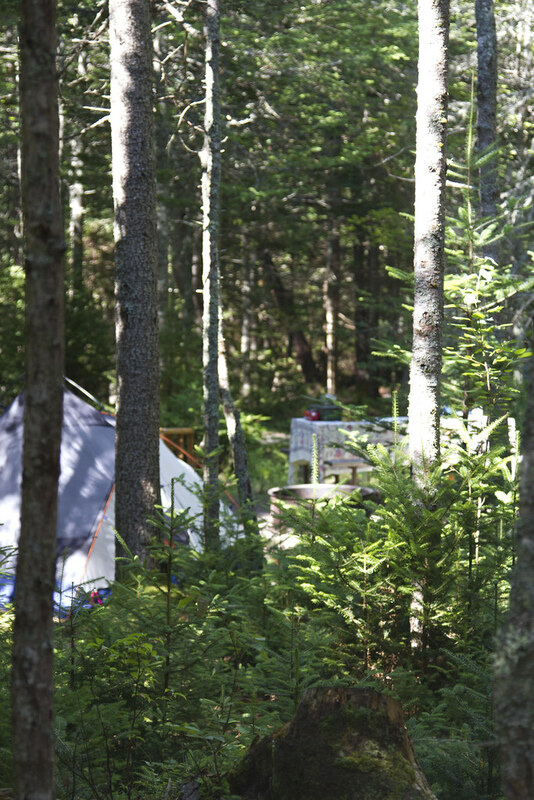 Last summer, we camped at a family campground in Maine for a week, and it was nice but it was a little less nature-y than we are used to, being surrounded by RVs and the sites not being secluded. 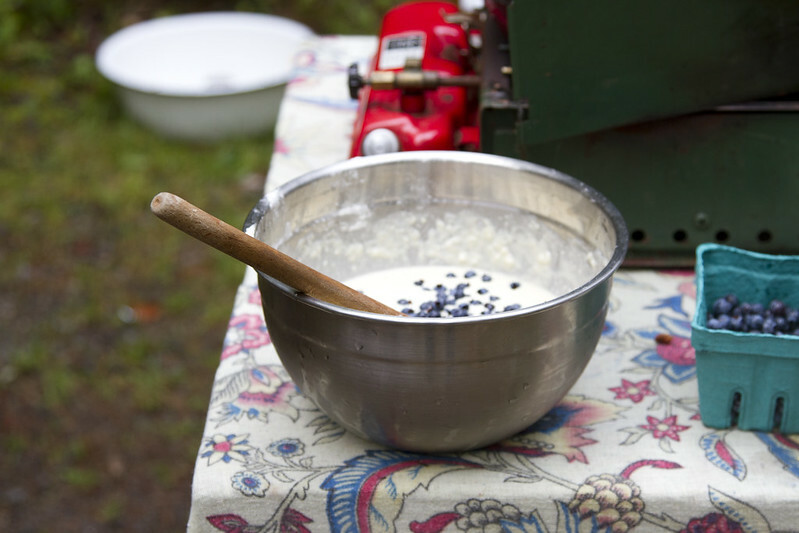 I pinned that skillet to my Camping board, btw. Definitely on my wish list! This post makes me nostalgic for the camping trips I went on as a kid, and has got me thinking that I should give round two a try as an adult. Which bags did you pack clothes et cetera in? I noticed in the post that showed the trunk of your rental a couple of sturdy looking canvas ones that aren't eye-sores and am curious to know where they are from. My apologies if I'm asking you to repeat yourself. Thanks! We have two canvas duffels from Beckel Canvas, a really great family-owned company from Oregon! Fair warning, they can be a little slow to ship/respond, but their bags are solid! Wonderful post! I've been reading you with such pleasure for quite a while now, and the fact that we were camping at Blackwoods, enjoying a fantastic vacation at the same time you did pushed me to finally comment. With a trailer-tent, we no longer go to Seawall, but I sure miss those wonderful walk-in tent sites. Summer vacations are made for camping, definitely! This looks like so much fun! I really need to get a camping trip organized this fall. It's been so long. Thanks for the inspiration! This actually makes me want to go camping–and that's saying something!! This is so cool – you made just the right vacation happen for your family. I too couldn't help but noticing the tablecloth – now we know it's true, you give EVERYthing just the right touch! Thanks Erin. Your sponsors will be pleased to hear I have just ordered a bunch of your recommended camping items! I think your philosophy of ordering beautiful, well made, durable items that last is one I am finally appreciating. We are headed out to the woods for Labor Day! I think our new additions will bring a lot of pleasure…. I know this post is a few weeks old, but I have a question. Where do you keep all your gear? This has always been my dilemma living in a small space. 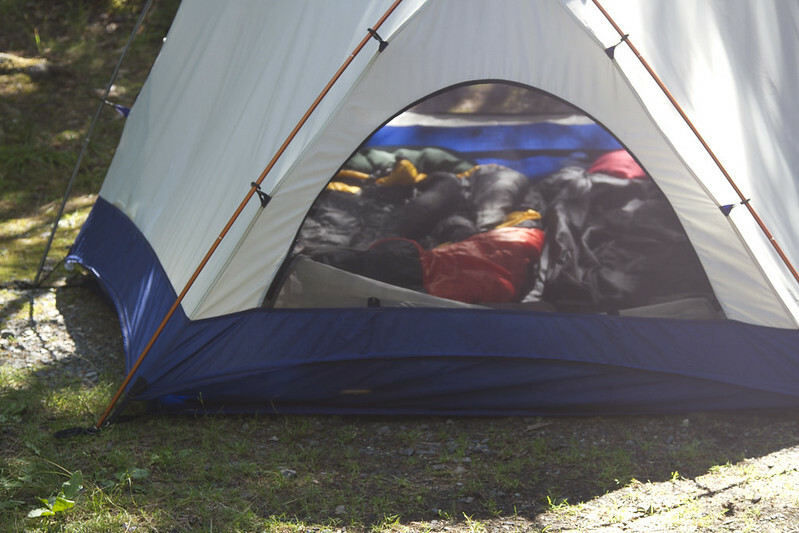 Our camping gear takes up an entire closet of its own. I think we keep things fairly simple, but everything is so bulky. And knowing that your apartment is even smaller than mine, I would love some advice on this issue. Thanks! I don't have a great solution here, other than that keeping other things minimal means we have more room for things like camping gear. We keep ours in closet space that we have in our apartment. Luckily, it doesn't take up too much room! What an excellent idea to use the stroller muff as a sleeping bag. We are hoping to go camping this summer and this tip will save us the expense of buying and then having to store a small sleeping that our daughter would just grow out of. 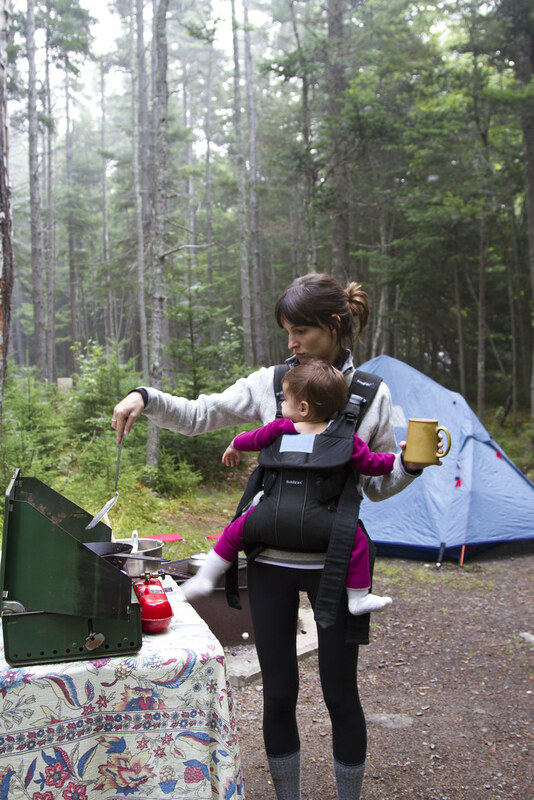 It was also great to read how doable a minimal camping trip is with a baby. I’m looking forward to planning our trip now. I love reading these posts about your Maine experiences. My family is headed there next week and people keep mentioning the mosquitos! Did you have any luck with a good bug spray for kids and adults while you were there? We had a bug spray from Badger Balm that we used last summer and this one (until it was confiscated at the airport two weeks ago!). I can’t say it kept the bugs totally at bay, but it did seem to help some! Sorry I didn’t see a link for the one you mentioned! 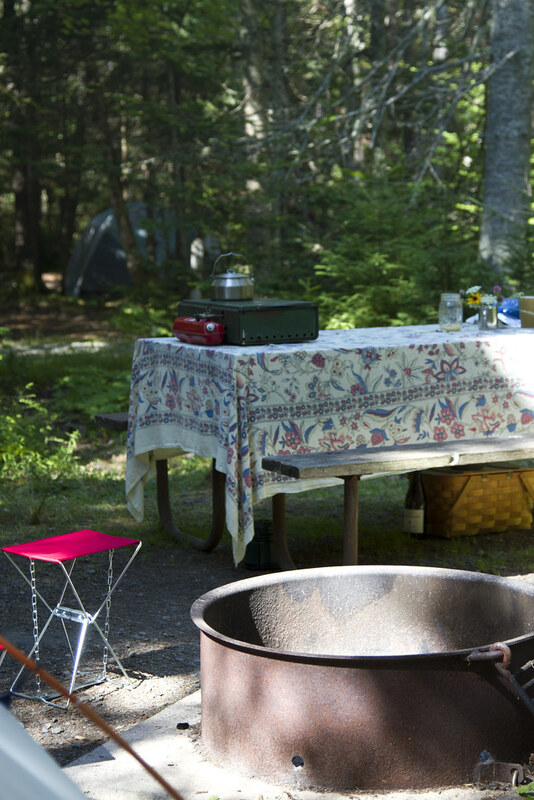 This is a lovely post and there’s so much love in the way you’ve set up your campsite. My eyes keep going back to the tablecloth and how beautiful the print and the fabric is…and how much it looks in place with the forest around it. and i’m not even a home decor or tablecloth person 🙂 is there anyway i can find a similar one somewhere?